Everyone around seemed so fixated upon them, as if nothing could be more important than dashing off to some far-flung region of Neopia in order to retrieve a mirror for an impatient, sneering Dark Faerie, or braving the wilds of some forsaken realm in order to ensure that Edna had Poogle fur clippings to add to her latest, noxious brew. It’s been a little over two years since Neopians stopped always being sure to leave the house with their least fav--erm, luckiest pet, should they have the misfortune of running into Boochi. These days, anyone who finds themselves staring down the business end of Boochi’s ray gun has little to fear, since his aim just isn’t what it used to be. But, after all these years, I was startled to discover that no-one had reported on the villains involved--or the scientist responsible. 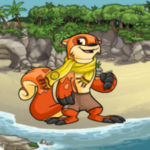 For Venn, an Orange Lutari left stranded on Lutari Island, that year’s Lutari Day could not have come soon enough. This was the one day of the year on which the storm around the island weakened just enough for magical teleportation through it to be possible. Kiko Lake Survivors Anonymous: Where's My Stuff? While this intense preparation may lead to victory, it also serves as an opportunity for one notorious team in Neopia to take advantage over all of the rest. For many of us readers, we have been greeted by the terrible “random event” regarding a certain team accepting donations of highly valuable items. For some of us, items of great value have been usurped by the winner of last year’s Altador Cup…Team Kiko Lake. The Benefits of Joining the Neoboards Today! Jumping into ongoing conversations can be scary for a new user, but just what are the rewards of taking off your lurker cap and jumping into fellow user discussions? The AC commentators have surprisingly poor observational skills.